A New Mac Tip Every Day: Activity monitor in your Dock! Activity Monitor is a pretty geeky app, but it is a truly amazing one as well! System slowdowns are usually caused by processes happening in the background that can occupy a lot of your ram or your processor. Even though there are no known virus for Macs, performance can still be affected by bugs or corrupted data. It is also really cool to watch Activity Monitor when pushing the processor to the limit with video encoding or another demanding task. Well, this can be done without having yet another window taking up precious screen real estate. In fact, it can be done right from the Dock. If you click the activity monitor icon in the dock and hold it for a few seconds, a menu will pop up. 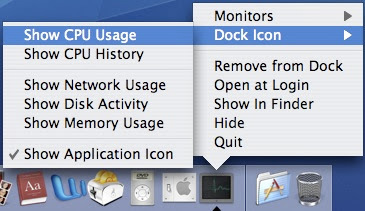 From there you can choose "Show CPU usage" in "Dock icon". you can also get the istat pro widget, it works really well too! Yes, this is, indeed, a very good tip! I found this application in my OSX computer in Application/Utilities and once I dragged it into the dock the instructions worked as described. Sorry, OT - but does anyone know why there is a process called "MassStorage", which sometimes causes a cpu-load of 140% until I reboot my MacMini? I can't unmount the usbsticks or sd-cards then, because one or more processes still use the device, probably "MassStorage". Maybe someone has an idea how to fix it. anyway, bill...open it up first. my activity monitor doesn't function at all, anybody know why? Doesn't this use ram as well? Its cool but ~ isn't is odd? Using the cpu to monitor how I am using cpu? All I did was open the Activity Monitor, click on "View" (up there next to the "File" menu) and then select "Dock Icon" and click on whatever you want to show in the dock. Backing up is the key! Moving photos and text when designing a website!